I am still trying to think of a good title for this one. However, you get what you get, so quit complaining. 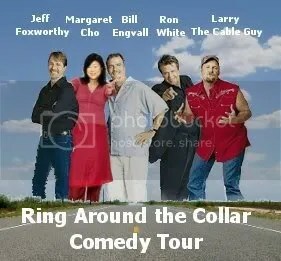 The other day my wife bought me the Blue Collar Comedy Tour DVD. Now, we like this stuff mostly because we are from South East Texas, and we get the jokes. Hell, we are related to people that just about every joke applies to. Oddly enough, we also like comedians like Margaret Cho and Eddie Izzard. Yep, I would really love to see that tour. Blue collar guys from Amazon page for the soundtrack. Margaret Cho picture from Yahoo movies page for I’m The One That I Want.